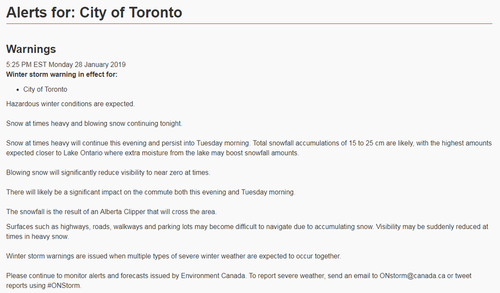 Here are the latest updates and closures as a snowfall warning is in effect for Greater Toronto Area. 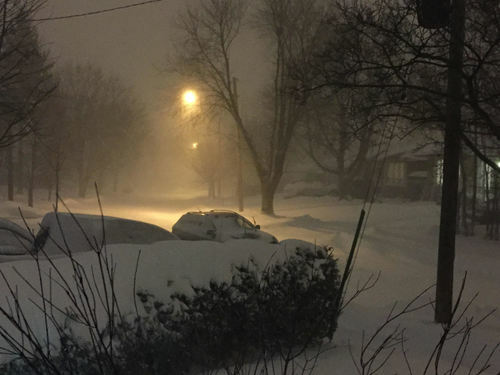 We're keeping track of all the latest #ONstorm developments. 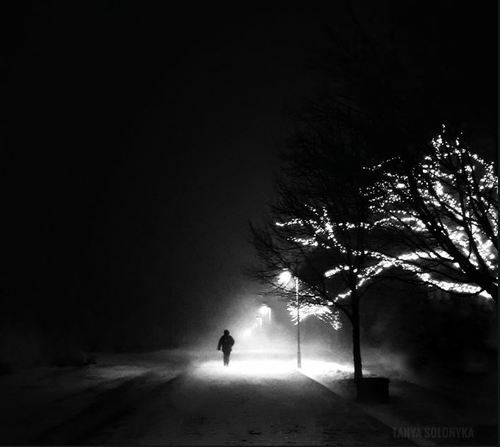 For information on closures, outages and travel at any time, head to CBC News StormCentre. 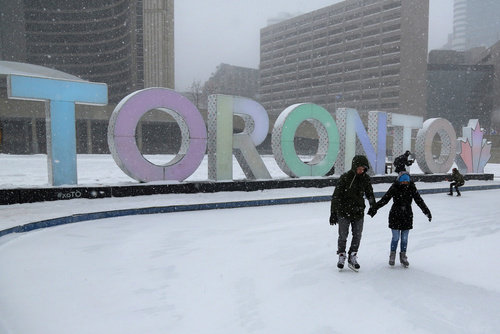 The storm is expected to blanket Toronto with 15 to 20 centimetres of snow by Tuesday morning. Expect delays on your afternoon communte. 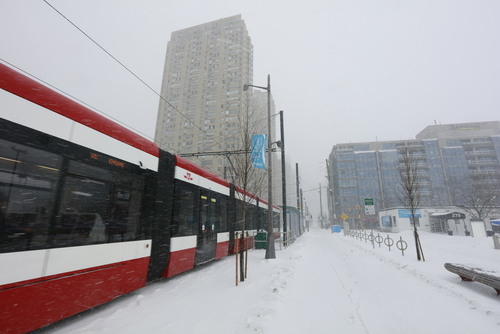 The TTC has halted service on Line 3 because of weather conditions. These brave souls are braving the blizzard at the ice rink outside city hall. If you're flying out of Toronto tonight, be sure to check your flight status. 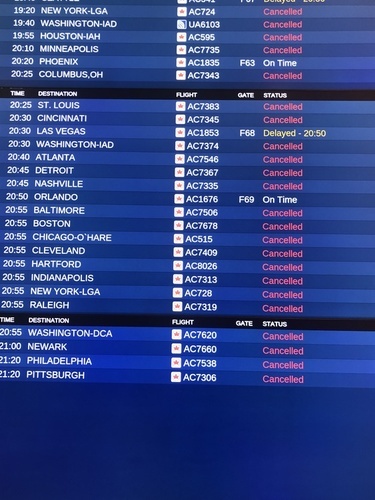 Approximately one in four flights leaving or arriving at Pearson International Airport have been cancelled. 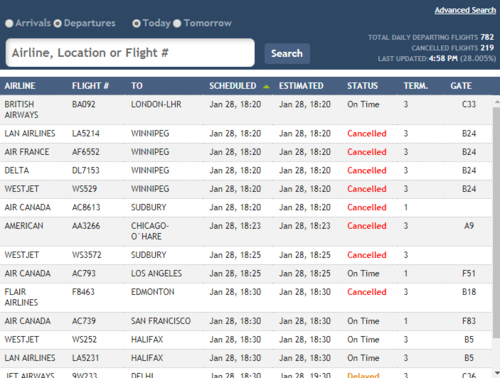 Dozens of flights at Billy Bishop Airport have also been cancelled or delayed. And a reminder: property owners or occupants have to clear snow and ice from the sidewalks adjacent to their properties within 24 hours of it falling. Hamilton residents have complained 387 times so far this winter about neighbours not clearing their snowy sidewalks. 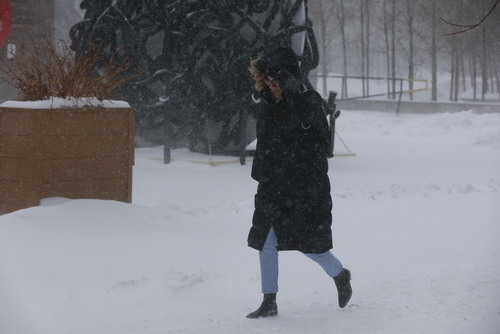 Winds gusting to 50 km/h are expected to blow the snow around, making for treacherous driving conditions during the afternoon commute. 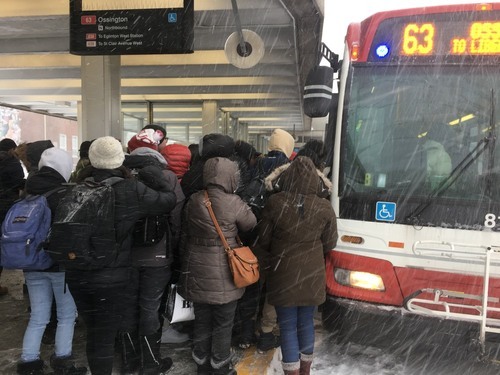 According to Metrolinx spokesperson Amanda Ferguson, TTC customers may board any GO/UPX vehicle in the City of Toronto limits without fare, and GO/UPX customers may board any TTC vehicle in the City of Toronto limits without fare. 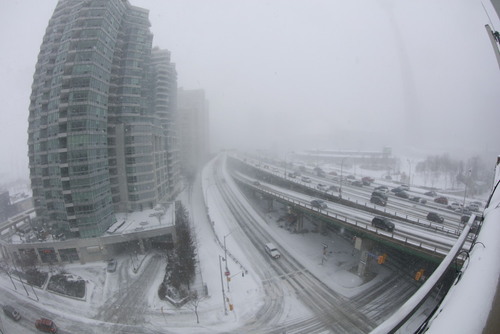 Environment Canada has now issued a winter storm warning for the City of Toronto, Halton-Peel and York-Durham. 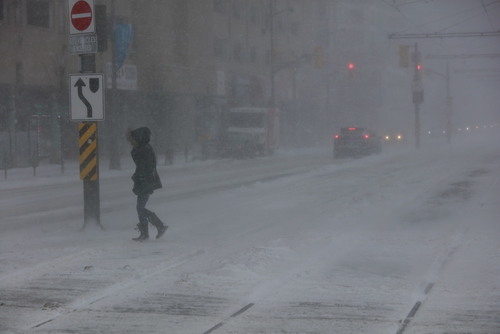 Total snowfall accumulations of 15 to 25 cm are likely, according to Environment Canada. The city's winter operations Twitter account says salting on main roads began around noon today. 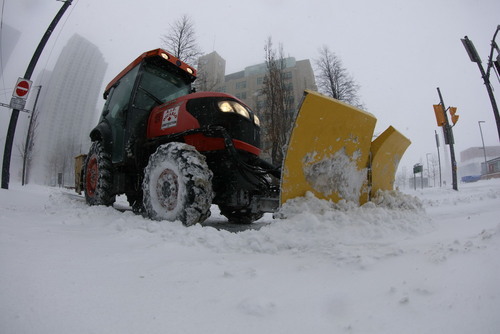 Plowing was set to begin when accumulations reached 5 cm. 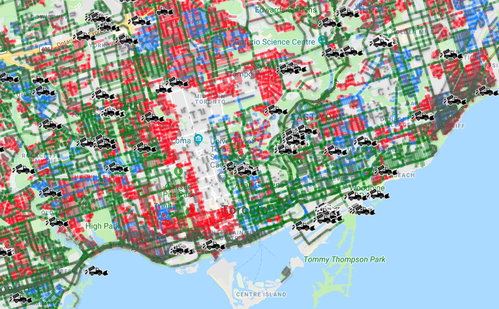 Want to know where the city's plows are right now? Take a look. Thinking of heading onto the roads tonight? Keep this in mind. Love this photo sent into us on Twitter. "How snowy is it? 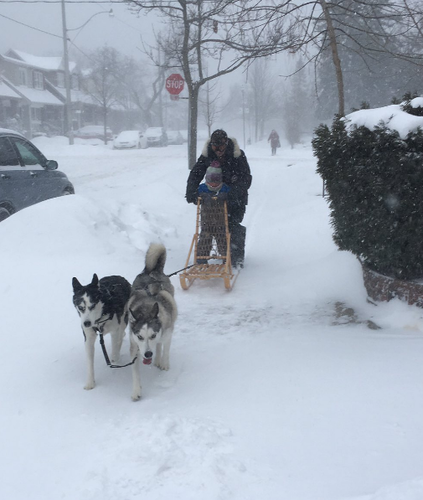 People are driving dog-sleds in Toronto!" Is it garbage night on your street? The City of Toronto asks that you put solid waste collection bins out by 7 a.m. but not overnight, and don't place bins on the road. They prevent snow plows from fully clearing your street. 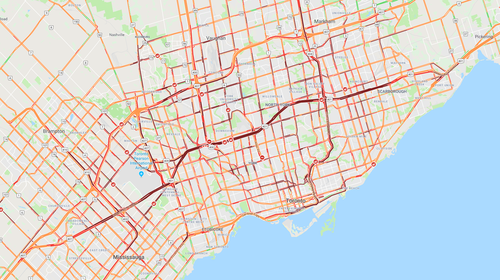 Plowing operations for expressways started on the DVP/Gardiner around 5 p.m., according to Toronto's winter operations. 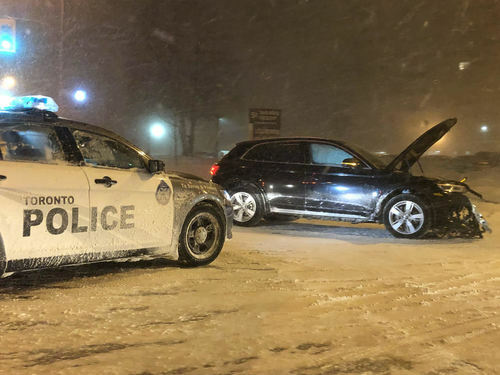 We're seeing several reports of accidents on GTA streets tonight, including this one near Ellesmere and Neilson Roads. According to Environment Canada, this snowfall is the result of an Alberta Clipper crossing the area.